Most of the time my go-to choice is a good ol’ fashioned chocolate shake. Sometimes I get a little crazy and go the cookies and cream route. But when the generous folks at Sweetworks sent me a big box of chocolate and candy the other day, I started to get an idea. As my husband can attest, when I get an “idea” it can sometimes be dangerous. But this time it was delicious. My idea was to mix some Sixlets into a shake which resulted in a cold, creamy vanilla milkshake with just a hint of chocolate and candy crunch. So, so good. In a blender combine ice cream, milk, and Sixlets candy. Pulse until milk and ice cream are combined and candy has crushed slightly. Top with whipped cream, then garnish with a few extra Sixlets. 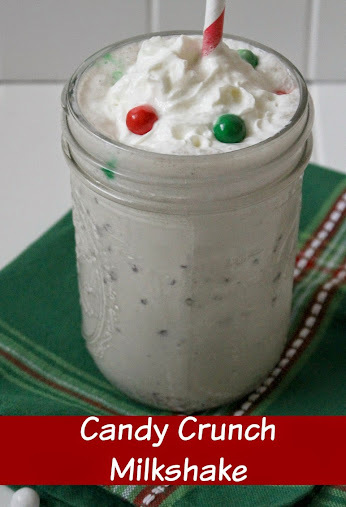 An easy and festive drink that would be a great surprise treat for your guests this holiday season. Everyone else will be doing hot chocolate and you will be the one everyone remembers as having those “awesome winter milkshakes”. Trust me! What other type of milkshakes do you like? A mint Oreo milkshake is my favorite! My favorite milkshake is a chocolate fudge milkshake. 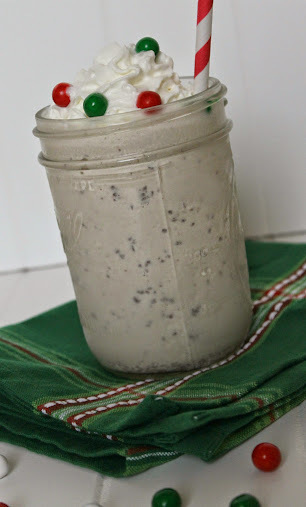 Mint oreo or peppermint milkshake…neither can be beat! My favorite kind of milkshake would probably have to be cookies and cream! My favorite kind of milkshake is just plain old vanilla it is the best to me! Cheesecake milkshake is my favorite, it’s so good. I’ve never had a cheesecake milkshake but that sounds totally up my alley! I love the strawberry milkshakes from Chik Fil A for sure! Loaded with whipped cream! Thanks so much for sharing your recipe, I may have to try that too! I’ve never had a Strawberry milkshake from there, but I LOVE Chick-Fil-A milkshakes in general. So yummy! I love strawberry milkshakes, and have since I was a kid! I love a chocolate milkshake with a little peppermint added sometimes! My favorite milkshake is Mocha Chip! My favorite is good ol’ vanilla, but sometimes I enjoy a cupcake milkshake (when I can find one!) Or seasonal flavors. I love Oreo, but my kids would definitely love this one. This looks incredible, now you have me craving a milkshake too! My favorite milkshake is the Vanilla Frosty at Wendy’s! Yum! I love tropical milkshakes! Coconut Cake Ice Cream, chunks of pineapple, extra coconut, maybe some macadamia nuts all mixed up together are great! My fave shake would be a mint oreo one! Yum! My favorite flavor of shake is chocolate. My favorite shake is chocolate. My fav milkshake has to be Chocolate, Malted. Yes, indeed. My favorite shake is strawberry. This sounds so yummy! And as it is summer where I live totally doable! I love a good chocolate almond milk shake with extra extra almonds!! My favorite kind of milkshake is the mint chocolate chip. I like chhocolate and vanilla too of course. My favorite milkshake is vanilla ice cream, tons of Oreos, chocolate sprinkles, and a little chocolate syrup! I’ve always been partial to strawberry milkshakes. My favorite milkshake is chocolate. I usually go with a strawberry milkshake. Howdy neighbor. I love chocolate milkshakes. Sometimes I make a mocha milkshake with chocolate syrup drizzled on top. Sixlets! I haven’t had those in years. How fun to combine them with a milkshake. Thanks for sharing!